This is the second barbecue book that Ross McDonald and the late Margaret Kirkwood have put together. Those of you who own a copy of ‘The Complete Australian Barbecue Kettle Cookbook’ will know the superb quality of their work. 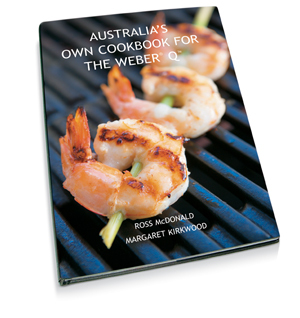 The Q cookbook is the sort of book that would make the perfect gift for someone who ‘loves’ their Weber Q, what ever the size. In it they show advanced cooking techniques for each of the Weber Q models, so that you can enjoy mouthwatering breakfasts, lunches, dinners and desserts for years and years to come. The book is not available in book shops. You can purchase this book by going to the store where you purchased your Q, or call Weber customer service and we can direct you to your nearest retailer.